Stunning views from the many large picture windows that frame the Forum and Colosseum. Open floor plan is bright and airy. This luxury apartment has three en suite king bedrooms and expands with a fourth bedroom by closing off part of the large living room with wall partitions. Working fireplace on chilly winter nights, Turkish steam bath, small gym area. On site concierge service for dinner reservations, theater tickets, tours and updates on events. Elegant decor includes wood flooring, wainscoting and crown molding. 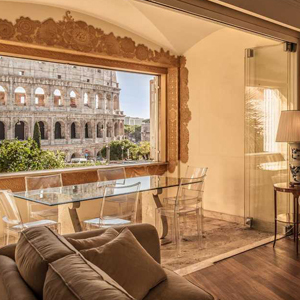 Spacious eat in kitchen, and veranda closed off with six panel galss doors and picture window a picture window that looks out over the Colosseum- the living room also has three large picture windows with views of Palatine hill and Forum. You can't forget where you are... just breathtaking. This neighborhood has a strong history - the original center of Rome where Rome began. The Colosseum, Palatine Hill, Roman Forum, Imperial Forums and Circus Maximus are all an easy stroll. While tourists flood the area during the day, it is a quiet residential area in the evenings, with good neighborhood restaurants and daily markets aimed at locals.